﻿ MKS 180: The "K" Stands for "Kombat"
MKS 180: The "K" Stands for "Kombat"
ROSTOCK, Germany --- The German Navy plans the MKS 180 multi-purpose combat ship as an all-rounder. Mission modules will cover a wide range of missions - with superiority in naval combat the ultimate aim. The MKS 180 will be an all-purpose weapon. Built-in modules designed for specific military missions will make this possible. These mission modules are at the heart of what "multipurpose combat ship" means in practice. The basic version of the MKS is already a full-fledged combat ship. Interchangeable components supplement this core capability and then adapt the ship for specialist missions. Two such mission modules are currently planned: one for ASW and one for custody module. The mission ASW module turns the MKS a dedicated submarine hunter. With onboard helicopters and their own sonars - in conjunction with the sensors of allied reconnaissance aircraft and submarines - the ship can secure a large sea area against dangers from the depths. The Navy demands from the future shipbuilder that the replacement and commissioning of the modules can be carried out as quickly as possible and worldwide, without interfering with the ship's structure and without a shipyard. In addition, the modules must withstand the climatic and oceanographic conditions that prevail in their respective field of application. Thus, the MKS will be able to travel in the tropics as well as possess an ice class to navigate polar waters. The marine architects calculate a length of around 155 meters for the MKS and a displacement of up to 9,000 tons of water. For comparison, the frigates of the "Baden-Württemberg" class are a good five meters shorter and nearly 2,000 tons smaller. And even these frigates are almost twice as large as the frigates of the "Bremen" class. 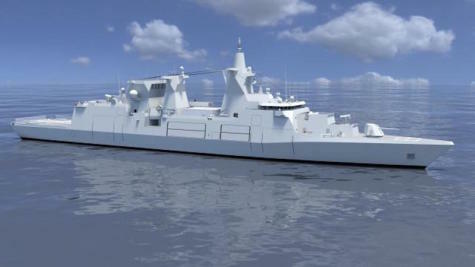 Compared to the frigates of the "Baden-Württemberg" class, which the Navy will put into service beginning this year, the MKS will adopt some features - above all automation and low maintenance of the technical equipment as well as the multi-crew concept.